The Chocolate Muffin Tree: Unbelievably Delicious Gingerbread Pancakes!!! Hope everyone had a wonderful Holiday! Our Holiday will still be going on for the rest of the week visiting relatives we haven't seen yet. Just wanted to share this quick recipe for Gingerbread Pancakes that we had Christmas Day! Everyone enjoyed them!!! We enjoyed them with chocolate chips and raisins. We didn't think syrup or honey were necessary! 3. Add the flour mixture to the liquid mixture and whisk until combined. 4. Let batter stand for 10-15 minutes to thicken. 5. Place 2 tbsp. of the mixture in a large greased saute pan over medium heat and cook for 2-3 minutes on each side. 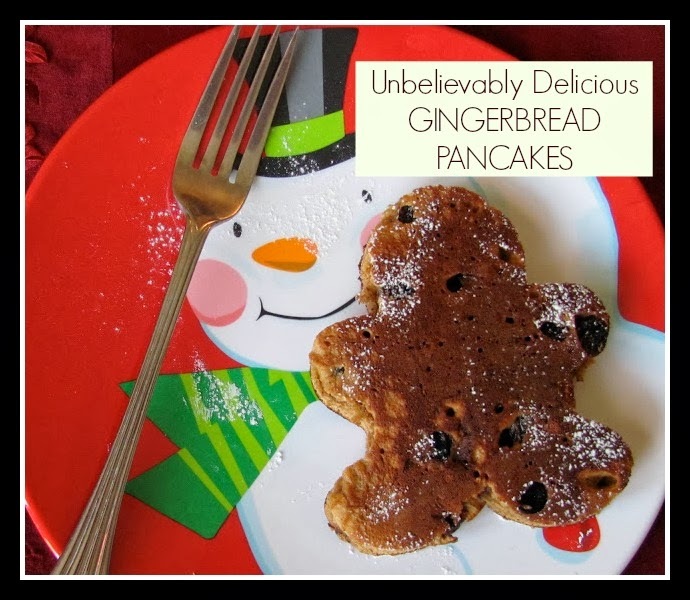 These Gingerbread Pancakes made the perfect breakfast for the holidays!!! I may be making Gingerbread Waffles too! What did you have for your Holiday Breakfast? My 3's class LOVED our gingerbread unit so I'm thinking these would be perfect for pajama day in January. Thank you! We had pancakes too! Loaded with strawberries, bananas and blueberries. I'll have to try your gingerbread pancakes as I'm a sucker for anything ginger! Thanks for the recipe. Homemade caramel sweet rolls. This do sound delicious. I'm saving this recipe. I need to get some molasses! These look yummy!